It's April, and beginning to look a lot like Spring, except for the days that still look a lot like Christmas. The weather is having a hard time deciding which season it wants to be in. One day, it's a snow storm, the next, it's nice. But, I hope it picks Spring and sticks with it soon. I am anxious to plant my garden! Over to the left, Richard has put links to the web sites he has been working on. For those who don't know, Bar's Cards, is his sister (Barbara's) web site. My mom's web site is the Boot buds and bags link. Check them out and let us know what you think. Some are still a work in progress. 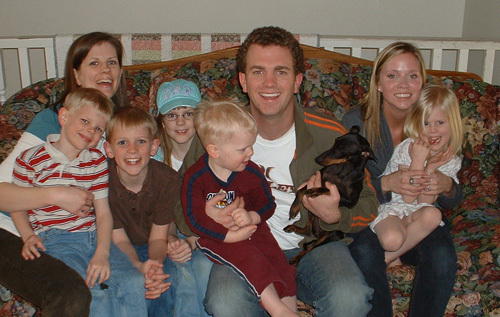 Below is a picture of me and the kids with our current renter's, Tyson and Amy, and their dog, Lexi. They left for the summer to sell alarm systems, but luckily we snapped this picture just before saying goodbye! They have been so much fun, and the kids will especially miss them this summer! Tyson and Amy have been babysitting for us on Wednesday nights when we go to orchestra rehearsals. We have been blessed with such wonderful renter's while living in this home! April 24, 2008 from "maren layton"
oh my word that video of your kids at home was so funny...so full of energy. sarah must be the quiet one...i didn't see her in the video! and i loved marianne dancing at the ball. what a fun idea! April 22, 2008 from "Ryan Burt"
Happy Birthday to my favorite sister. Hope you have some fun today. Eat extra cake for me. April 6, 2008 from "Janae Pew"
I love your blog! We sure do miss you guys. We miss being in the orchestra with you guys. Take care--we love you! April 5, 2008 from "Jenni Warner"
I know I've already made a comment this month but man you guys are all so stinkin cute! I loved seeing pictures of the Ashton's and couldn't help but feel like I was missing out big time! I really miss you guys and can hardly stand being so far away. We are loving it here but seeing you all makes me want to just come right back "home". Richard...congrats on the new Chamber group! What a neat thing for you...and you said you would do it someday and now you have. The website looks awesome and I'm sure the kids know how blessed they are to have you and Brian in their lives. Keep me posted and maybe I'll be there one of these days to see a concert. Lovs from us! April 3, 2008 from "Alison Ferguson"
I love the pictures of James and Brigham playing at the sink! And the girls playing school -- how sweet is that?!? We love you guys and are glad you're doing well!